Over the last 100 sessions, the Canadian dollar and oil (front month light sweet crude) have moved in the same direction about 79 times. From the middle of November 2014 through mid-January, the relationship was even tighter at about 95 days on a rolling basis. However, the capital flows into and out of Canada swamp the value of oil exports, which are also offset by the fact that provinces in the east import oil. In fact, the traditional pattern has been for the eastern provinces to import more expensive Brent oil, while a few western provinces export cheaper oil to the US. In 2014, Canada's exported about $105 bln of energy products and imported about $46 bln of energy products. Let's not forget that Canada is an important exception to the US ban on oil exports. 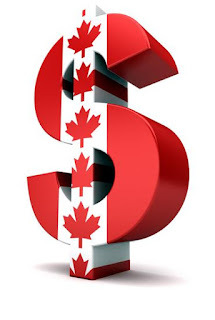 The importance of oil for the Canadian dollar is not just about the value of its single largest export but it is more general proxy in the current environment for the overall Canadian economy, which had become highly leveraged to oil prices. It was an ATM, like US home equity loans, that bolstered consumption, investment and asset prices. The Toronto Stock Exchange Composite is the only major equity market that is lower thus far this year, for example. This Great Graphic, composed on Bloomberg, shows the Canadian dollar (yellow line) and the two-year interest rate differential (white line) between the US and Canada over the past year. The big rise that took place in both time series in January was not the result of oil prices, which were putting in a temporary bottom, but rather the Bank of Canada's surprise rate cut. Today the US premium is almost 29 bp, and is the most since July 2007. Following news that the Canadian economy unexpectedly contracted, there has been renewed speculation that the central bank will likely have to cut interest rates again. At the same time, the Federal Reserve has confirmed its intention to raise rates later this year, provided the labor market shows "some" more improvement. The fact that the two central banks are moving in opposite directions is a weight on the Canadian dollar. The decline in oil prices is a factor influencing the economy, which is what the Bank of Canada is interest in when setting policy. Policy is what investors appear particularly sensitive to in the current environment.